A dryer that dries my hair and isn't the ugliest thing on the market - that is always what I've gone for. Over the last 12 months I have cut back alot on using a hairdryer and heat in general in a desperate effort to grow my hair and - yes it does work! But no hairdryer often leads to a frizzy, unmanageable mane or just shoving my hair up when it is wet - not always the best look, especially for work. So when I was contacted recently to try out the ghd air Hairdryer I jumped at the chance. I had be hearing so much about this hairdryer - and all amazing things. It promised alot - a salon finish, less heat, a quicker dry, locked in moisture - how could I not want to try this? My previously hairdryer, even though it was a fairly okay brand and worked (what I thought was) well, it took good while to dry my whole head after a hair wash and with seriously seriously HOT air which I always knew was NOT good for it. It left my hair feeling dry and damaged. ghd are a brand I have been using for years - I have literally had the same pair of straighteners for TEN years (and they are still going strong!). So I know that their products are brilliant quality which really do work and really do last. So I had high high hopes for the ghd air. Receiving the parcel was like Christmas and my Birthday all over again, I was so so excited to see the beauty and put it to the test! First of all lets talk about the look. The ghd air's look reflects the promise it gives - so sleek and professional. Simple black with metallic features this hairdryer looks salon perfect and of course matches my classic black straighteners. Now a few facts - this hairdryer comes with a handy 3m cable (fab for us girls who are doing 10 things at once and need the flexibility), it is 2100w and comes with not only variable controls for temperature and power but also a great, easy to reach, cool shot button. It comes with 2 different concentrator nozzles and I was also lucky enough to receive a separate diffuser. Having a professional-strength motor makes this hairdryer super quick at drying and it's advanced technology reduces frizz and flyaways (hallelujah) as helps to lock in moisture - so that's half the regular drying time and a salon result. Perfecto. 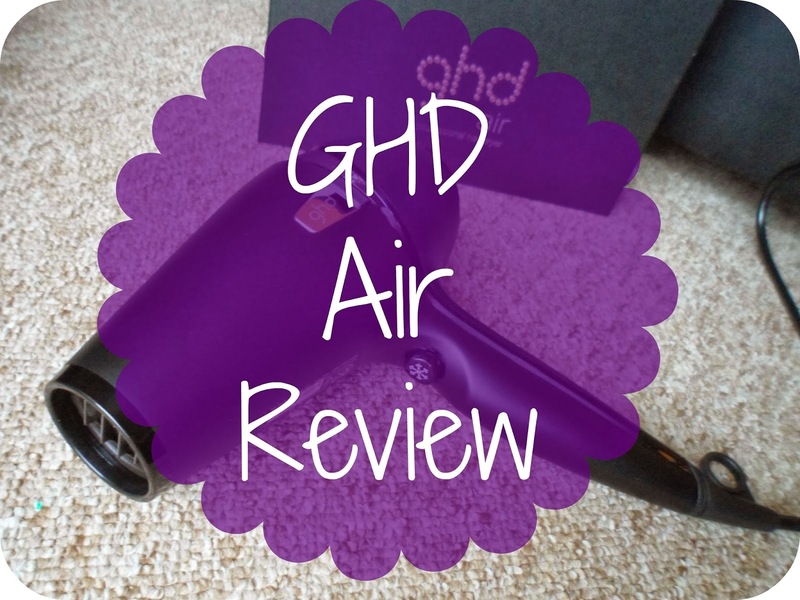 So here's what I think of the ghd air.... Wow. Never did I really think that a different higher-end hairdryer would have such different effect on my hair. This hairdryer has so many benefits I don't know where to start. First of all this thing is so much quieter than a regular hairdryer. Even my boyfriend came in and commented on it - which is a major bonus when you want to listen to music whilst you glam yourself up. The time it took to dry my hair was, like it promised, halved and with what felt like hardly any heat or force at all - another bonus right there! My hair afterwards felt smooth, soft and sleek (and NOT frizzy....it's a miracle!) just a salon blow-dry. My hair felt alot less dry than it ever does with my usual hairdryer and the fact it was so smooth and sleek meant that it only need a tiny bit of styling afterwards - which meant even less heat being used on my hair, top marks ghd! At £99 yes it is a little pricier than other dryers out there on the high street but I can honestly say that for me, this feels so so much better and works a whole lot better than a regular hairdryer! Really it is an investment, just like a pair of straighteners and with my experience with ghd products will last a long, long time. I definitely think I'm going to be using a hairdryer alot more often now - this beauty is so much better for my hair and seems to use alot less heat which is perfect for me while I'm trying to grow my hair out still! After looking through the hairstyles on ghdhair.com and falling in love with some of the masterpieces so thought I would give a party look a go myself with the aid of my air! 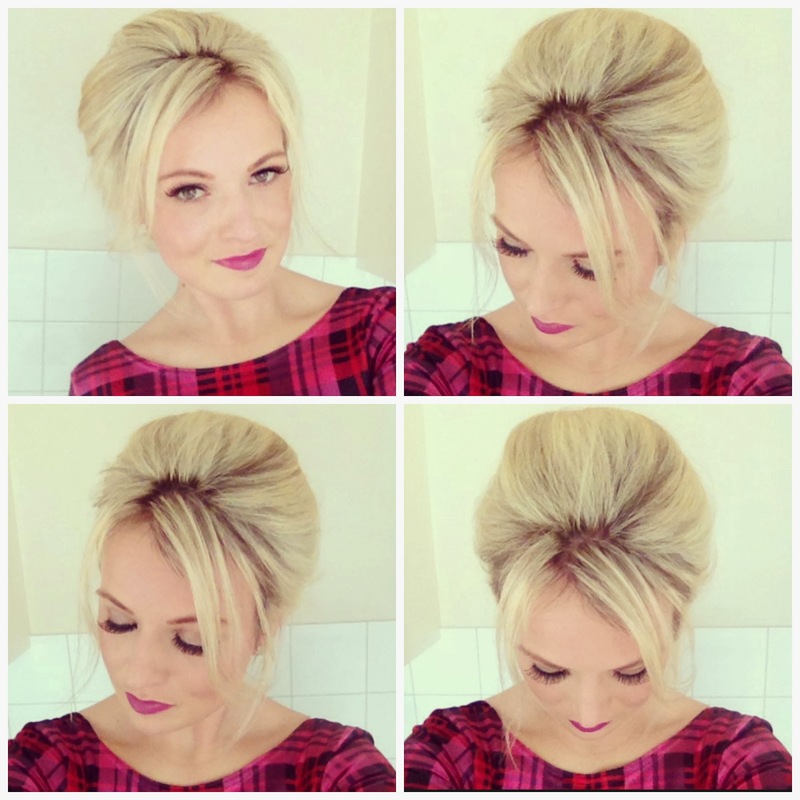 Normally when I go out I like to wear my hair down with extensions, but after seeing some of the gorgeous up-do's on the ghd website I thought I'd try something a little different and see what I could come up with! All I used for this look was my ghd air, a heat protectant spray, a round brush, kirby grips and a touch of hairspray to finish. This was simple and easy - how I like my hair to be! I just half-dried my hair upside-down (helps to keep volume) and then separated it into 2 sections. I then used my round brush with the hairdryer to create a beehive type lift on the top section and dried the bottom section as normal. Then after just a tiny bit of backcombing at the top I gripped my beehive section and then simply gripped the bottom section up into a small bun. So the only heat used for this look was with my GHD air - it is sleek, smooth and free from more or less all fly-aways with basically no heat applied! This hairdryer is a total game changer! I definitely want to wear my hair out like this out on a night-out soon - I feel very 'The Help/Hairspray' ... both amazing movies right?! What do you girls think? I really like the sound of this! Like you, I have been a lover of my ghd straighteners for years! I think it's time I try the hairdryer! This sounds amazing! I have so much hair, anything that cuts the drying time down is a winner in my books. Your hair looks absolutely gorgeous here! Ah this looks amazing! I've been thinking about getting a new hairdryer for a while and this may be it!